When the weather’s sweltering hot and your stomach’s grumbling, the last thing you probably want to do is preheat your oven to 350° or stand over a hot stove. Before you spend all summer glued to the super market freezer aisle or holed up in your local ice cream store, consider the following summer dinner ideas. They’ll fill you up and cool you down at the same time, but are much better for you than an ice cream dinner! There’s nothing better than biting into a juicy slice of fresh watermelon on a hot summer day, and beyond being absolutely delicious, it’s the perfect way to cool off. Watermelon has a high water content, allowing you to hydrate yourself while enjoying something sweet. It’s completely fine to give into your ice cream craving every so often, but eating a waffle cone every night isn’t going to do great things for your health—or waistline! For a healthier, refreshing alternative, make yourself a fruit smoothie. Yogurt and fruit provide great nutritional benefits and will still satisfy your sweet tooth. Soup may sound like a cold-weather food, but chilled soups are a nice way to cool yourself off on a hot day. Gazpacho is one of the more popular chilled soup recipes, but you can make a chilled soup from everything from cucumbers and avocados to fruits like blueberries. If you need a break from burgers and other hot grilled sandwiches, wraps are the way to go. Spread a spinach or whole wheat tortilla with creamy cheese, salsa and sliced deli meat for a light but satisfying lunch or dinner. Pack your wrap with water-heavy veggies like cucumbers for even more refreshment. Easy pasta salad recipes are some of the best to have on hand during the summer; they’re simple to throw together in a few minutes, can include tons of vegetables and are a hearty way to cool off. Stay away from mayonnaise or sour cream bases and choose olive oil, pesto or a light salad dressing if you’re trying to stay healthier. 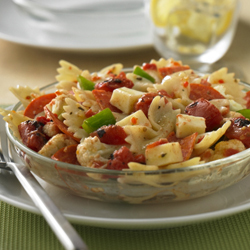 Try this yummy antipasto pasta salad from ReadySetEat the next time you need a quick summer meal. Made with Italian dressing and fresh veggies, it’s a delicious, lighter way to cool down this summer. Cook pasta according to package directions. Drain and rinse under cold water until cool. Meanwhile, stir together drained tomatoes and dressing in a large bowl. Add pasta and all remaining ingredients; toss to combine. Serve immediately or refrigerate until cold. Author Bio: This is a guest post by Meredith K. on behalf of ReadySetEat. For easy grilling recipes and more, visit www.readyseteat.com.